Steve Wynn spent most of Thursday's Wynn Resorts earnings call complaining about the government in Macau, but he also had some comments about Las Vegas. "We made a whole bunch of changes in the casino, both physically and procedurally. We've even fooled with the rules of the game. It's been 50 years since Las Vegas increased the price of gaming. We're way overdue considering the cost of running games and payroll. We've adjusted our yield rate management approach. Maurice Wooden is here and he's very good at that in the whole American operation. We've made a host of adjustments. We were off in one month from $100 million in baccarat to 45. We were off $55 million in baccarat but we made almost the same amount of money because of all the adjustments we made. And they go across the board throughout the hotel. And the way we price the hotel, the restaurants, and entertainment and gaming. We don't sit by and allow ourselves to become victims of anything of any aspect of our operation over which we have any control. So my long term view of our operations in America and in China is still positive. It's the short term that's bewildering." The Nevada Gaming Control Board has ruled that daily fantasy sports (DFS) is a form of gambling, and needs to be licensed to be legal. Unlicensed operators, most notably DraftKings and FanDuel, have been effectively shut down in the state of Nevada as of today. Licensed operators in Nevada (the sportsbooks) can offer daily fantasy, but they largely don't have the technology yet. I wonder if some of the bigger players like William Hill and CG Technology will step up to the plate. The ruling brings daily fantasy sports to an interesting crossroads. DraftKings and FanDuel could probably get licensed in the state of Nevada if they really wanted to, but their entire business hinges on the premise that they don't offer gambling. If they admitted they offer gambling by getting a Nevada license that would probably put them in hot water with other states, not to mention the sports leagues themselves. Now the question is whether other states will follow Nevada's lead and ban DFS, or is Nevada the only state that really cares enough to do anything since they want to protect their other gambling interests. I look forward to the day when all sports gaming is legal in every state (well, except for Utah) and we don't have to go through with this "is it gambling" charade. Today's Wynn Resorts earnings call was particularly interesting with a frustrated Steve Wynn on the line. The reason for Steve's frustration: the government in Macau. Macanese gaming regulators set the number of tables a casino is allowed to have. With the government seeking to de-emphasize gaming in favor of non-gaming activities they have been stingy with the amount of tables they are willing to license. The brand new Studio City development by Melco Crown recently was only granted half of the tables they had asked for, and that decision was made a mere two weeks before the property is set to open on October 27, 2015. Wynn was not happy about this, as it doesn't bode well for his upcoming Wynn Palace opening March 25, 2016. Aside from the prospect of having less tables, not knowing how many they're going to have makes staffing decisions almost impossible. When speaking about the government's policy of allowing less tables Steve shouted, "The damn casino is the cash register!" That prompted one analyst to thank him for being "refreshingly frank." Steve Wynn unlike other CEO's likes to speak freely about the issues of the day without worrying about what people will think. One exception though is China. Wynn usually chooses his words about the Chinese government very carefully without questioning them. He seems to be getting away from that strategy though and if today's call is any indication he's now willing to let the government know exactly what he thinks. 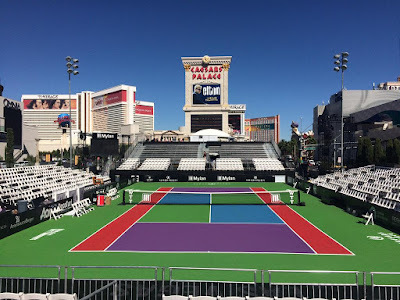 A temporary tennis court arena was recently installed in front of Caesars Palace to host a celebrity charity event. Billie Jean King and Elton John hosted Mylan WTT Smash Hits benefiting the Elton John Aids Foundation (EJAF) and local AIDS organizations. The event has raised more than $13 million since its inception. This is the first time the event has been in Las Vegas. This year's event raised over $1 million. Andre Agassi, Stefanie Graf, Martina Navratilova, Tracy Austin, James Blake, Mardy Fish, Lindsay Davenport and Andy Roddick were among the tennis stars playing. Tennis Channel tweeted this picture of the setup during the day. Appropriately the Elton John Caesars marquee was in the background along with Mirage and Treasure Island. Caesars Palace tweeted this picture of the arena during the event at night, with Caesars in the background. 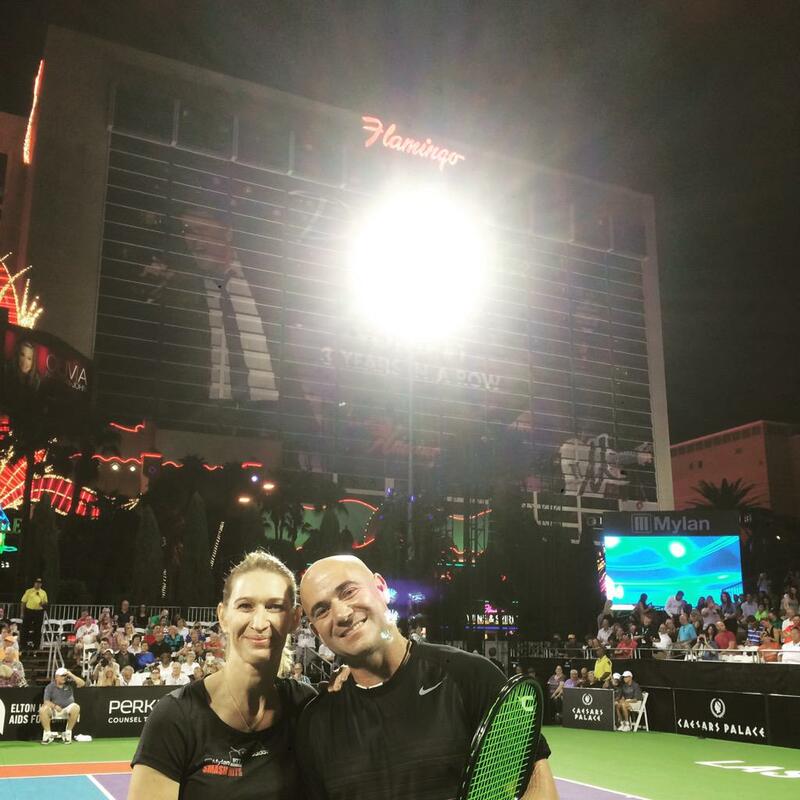 Andre Agassi tweeted this picture of himself with wife Steffi Graf and Flamingo in the background. 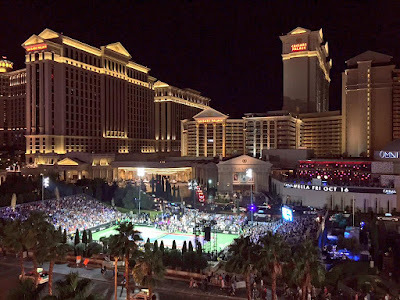 The Democratic presidential debate is taking place at Wynn Las Vegas tonight. Las Vegas will do it all over again a year from now though, as the Thomas and Mack Center on the UNLV campus will host the third and final general election debate on October 19, 2016. It almost never rains in Las Vegas, and when it does flash flooding can occur. One place that is almost certain to have flooding during a storm is The Linq hotel parking garage. This spot has been prone to flooding for years, dating back to when it was the Imperial Palace. These videos make the Linq parking garage river look pretty dramatic, but I'm guessing this happens frequently enough that the staff knows how to re-direct traffic away from the rushing water.